Bathroom Remodeling Project In Swarthmore, PA - Cottage Industries Inc. 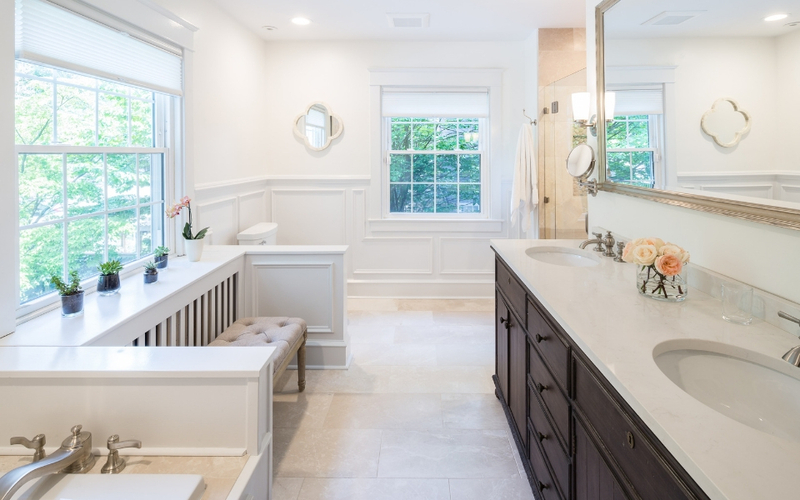 This project is a 3-bathroom remodeling project in Swarthmore, PA – a powder room, a hall bath, and master bath. The family was concerned with the schedule and wanted to get the construction work done as quickly as possible. To make that work, we decided to do all three rooms at the same time rather than doing them in phases. 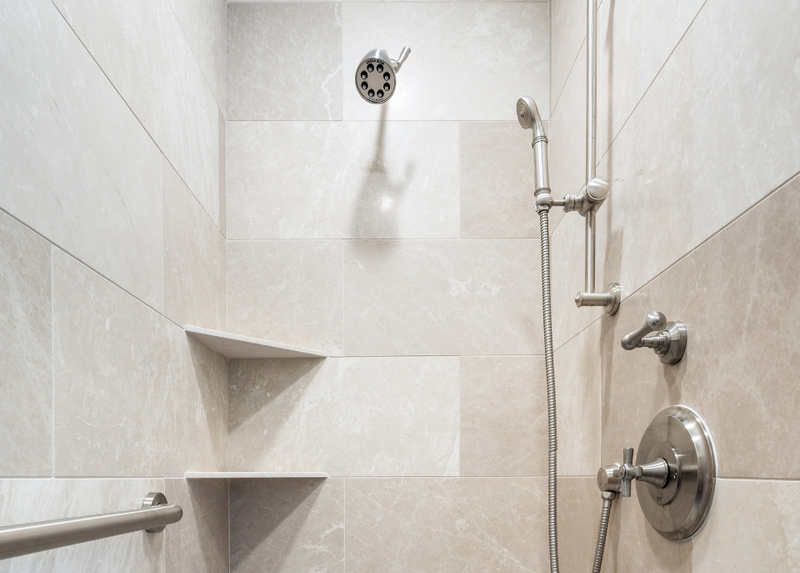 To pull this off, we decided to create a temporary shower in the seldom-used third floor bathtub for the family to use while the work was in progress. They were champs, all three of them, sharing that little third floor bath while the house was torn apart! One of the biggest challenges on this job was making sure the home stayed as clean as possible during the work, and especially during the demolition. To accomplish this we set up plastic barriers to isolate dusty areas from clean living spaces. The difficulty was that we were working on all 3 floors of the home, in 4 completely different areas including the master bedroom and closets. Another challenge was carefully balancing budget and design. To assist in that regard, the homeowners worked with our interior designer who helped select all of the design aspects before the job began and continued to fine-tune as the work progressed. 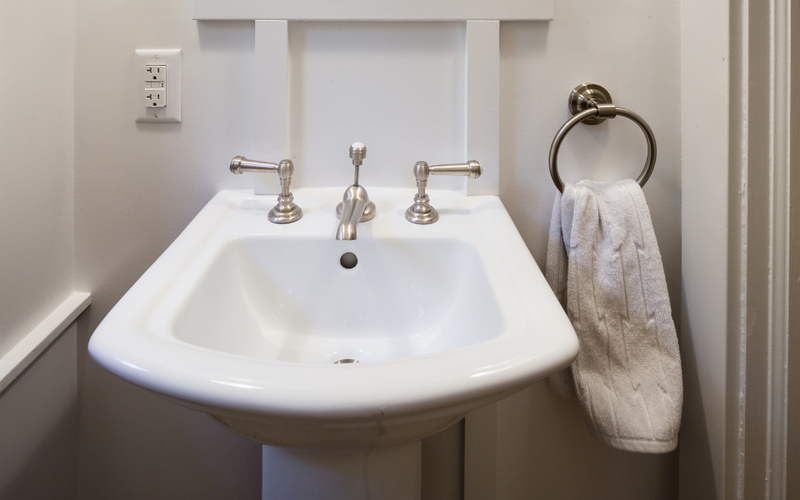 The Powder Room: The homeowners wanted an attractive powder room for their guests to use. 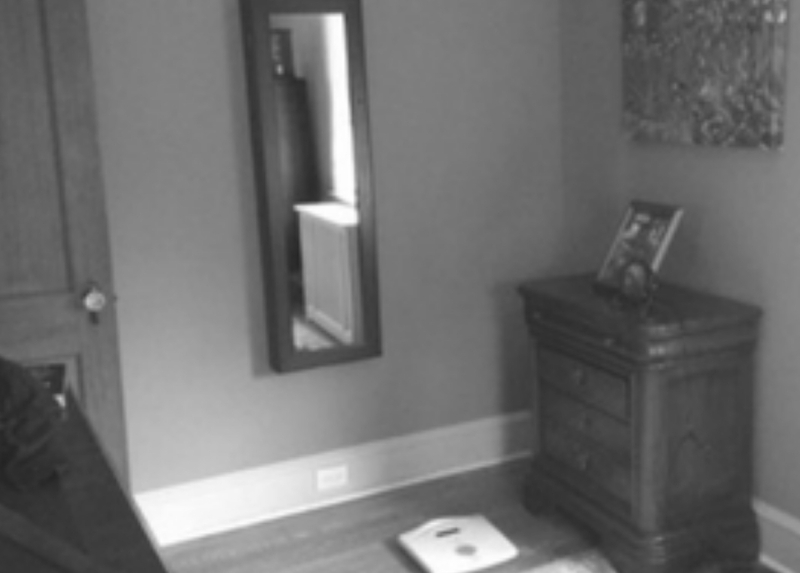 Most of the work in this room was cosmetic in nature, but the homeowners wanted to beautify tiny space and make it feel larger, add sorely needed storage, and remove the ugly wallpaper and the old tile wainscot. The floor and toilet were new, so those elements were retained. 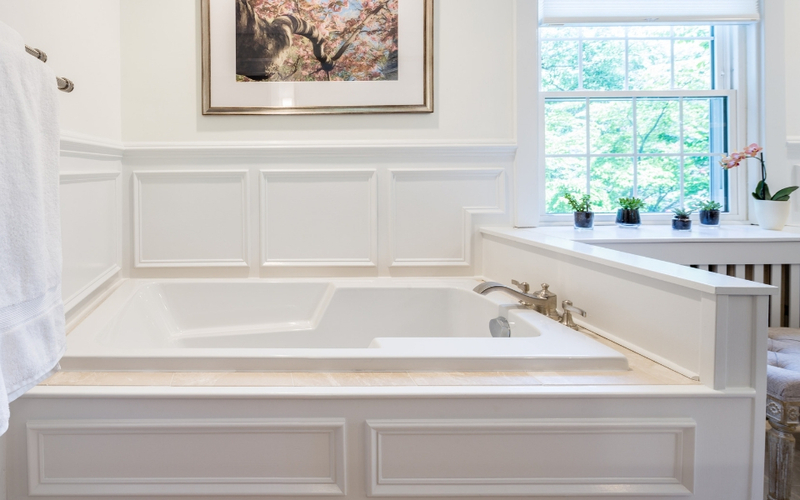 The Hall Bath: In addition to more storage, the homeowners wanted everything replaced in this room. For budgetary reasons plus the fact that the bathtub was an unusual size, they agreed to keep it. In the end, it was replumbed and refinished with a beautiful new acrylic glazing and looks like new. We realized during the design phase that we could use some space from a too-deep hall linen closet that was located behind the wall of the bathroom to give the homeowners some extra storage they were looking for. We took over part of that hall closet and designed and built a beautiful custom cabinetry piece with three drawers and a towel cabinet above. 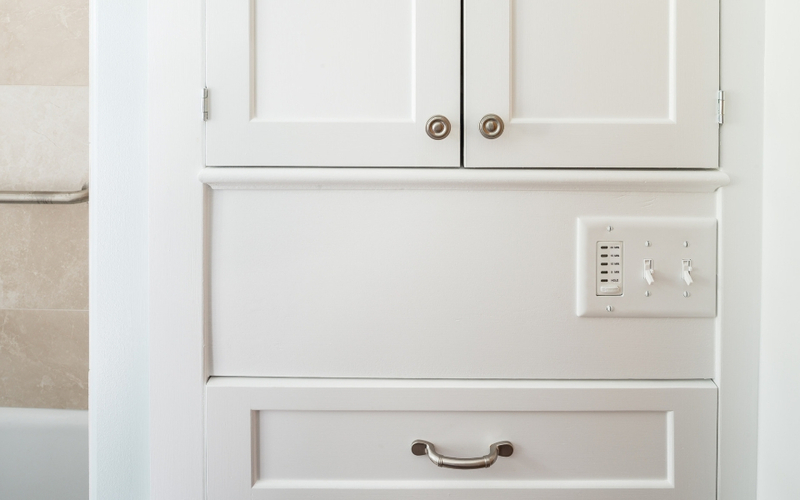 As it turned out, there were hidden wires and pipes in the way of the place we wanted the cabinetry. 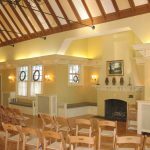 The budget became an issue with the needed work, but through clever placement and the kindness of the subcontractors involved, the added charges were kept to a minimum and the homeowners thought the results were well worth the extra expense. We also preserved the hall linen closet so it could still be used from the hallway but without all the wasted space in the back. The NEW Master Bath: Initially the homeowners wanted to simply renovate the existing master bath which was as small as the hall bath (if not smaller). It seemed like a waste to spend all that money and not get something at least a little larger. During our first design meeting, we discovered a dressing room on the other side of the master bedroom that the homeowners did not really utilize. The lightbulb came on as we realized this was the perfect place for a new master bath. Though it pushed the budget higher, this solution was vastly better than what the homeowner imagined was the best solution for their concerns. We then decided to turn the existing too-small master bath into a decent sized walk-in closet. While there was no existing plumbing in the new bathroom space, the first floor powder room was located directly below, making the conversion fairly easy. The homeowners loved the idea of a larger, more luxurious master bath! And as a bonus, the re-sale value of the home shot up with this solution. 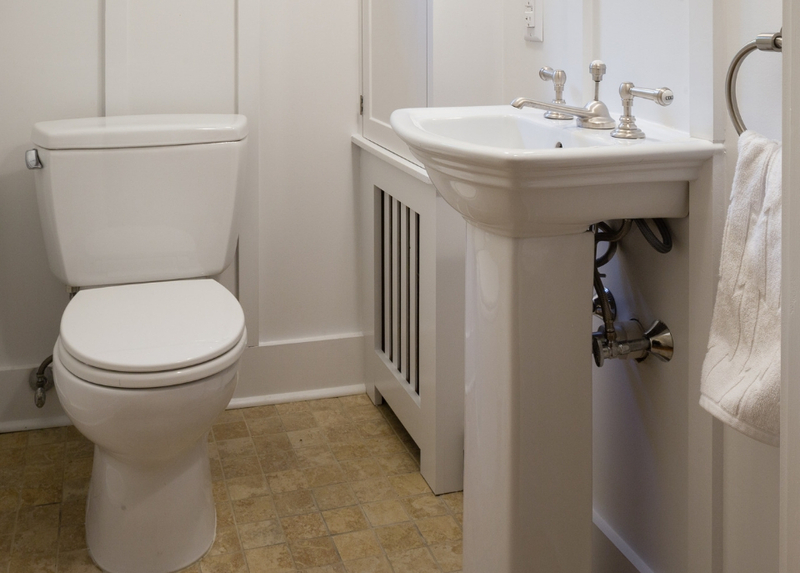 To make the layout work, we placed the tub and toilet at opposite ends of the space with a seating nook in between with a half wall connecting continuously from the tub to the custom radiator cabinet to the privy. There was an existing clothes closet that was expanded and turned into a gorgeous curbless shower with tile niche, angled bench and shelves, and frameless glass door. 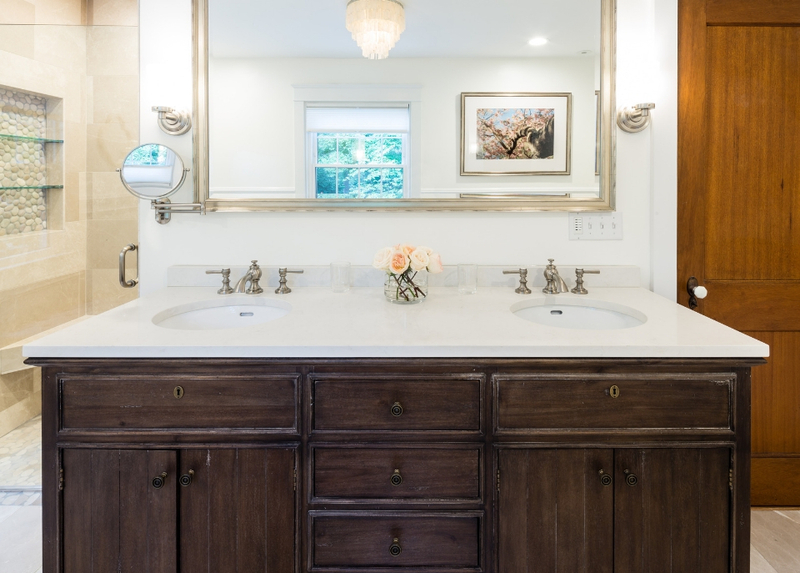 While our tile, plumbing, and carpentry pros had to carefully coordinate their schedules to get the job done on time, it was our interior designer who perhaps played the biggest role in getting the homeowners the master bath they dreamed of. 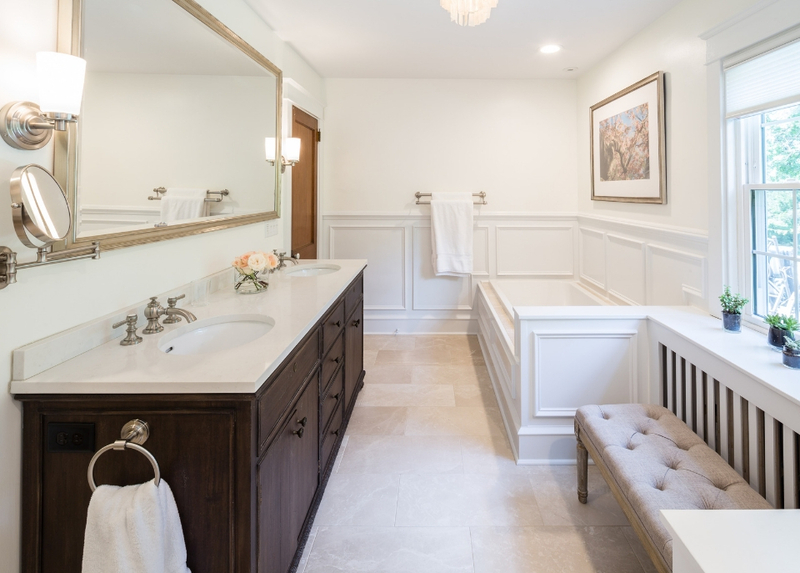 Her choice of fixtures, tile, and the decision to build the custom cabinetry pieces and custom wainscoting really gave the room a one-of-a-kind retreat look and feel. During the framing stage, a decision had to be made about where to place the pipes. The major challenge was putting in a new plumbing stack from the basement to the new second floor master bath without cutting into any of the existing living room areas. Fortunately, our experienced plumber was familiar with older homes. We were able to open up the powder room a little more than originally planned to place the stack inside that wall. It was a tight squeeze, but the job went smoothly, everyone was happy with the results, and the homeowners saved a lot of money by only having to run one main stack with no collateral damage to the living room walls. 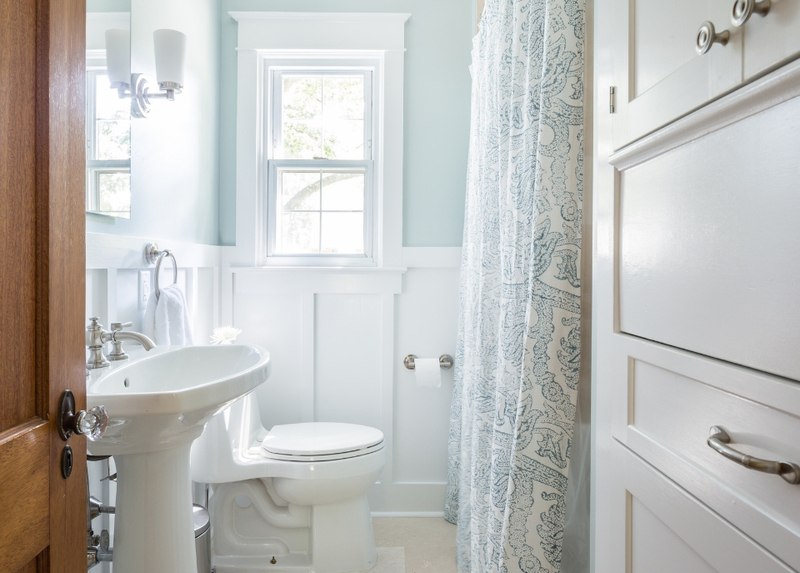 For this project, our interior designer had a lot of specific ideas for each bathroom. Each room was slightly different, so it was important to focus on the small details. To stay on track, pictures were taken throughout the process and sent to the designer to ensure the finished work was what she was looking for. Many older homes on the Main Line and surrounding areas have large, unattractive cast-iron radiators, and this home was no exception. 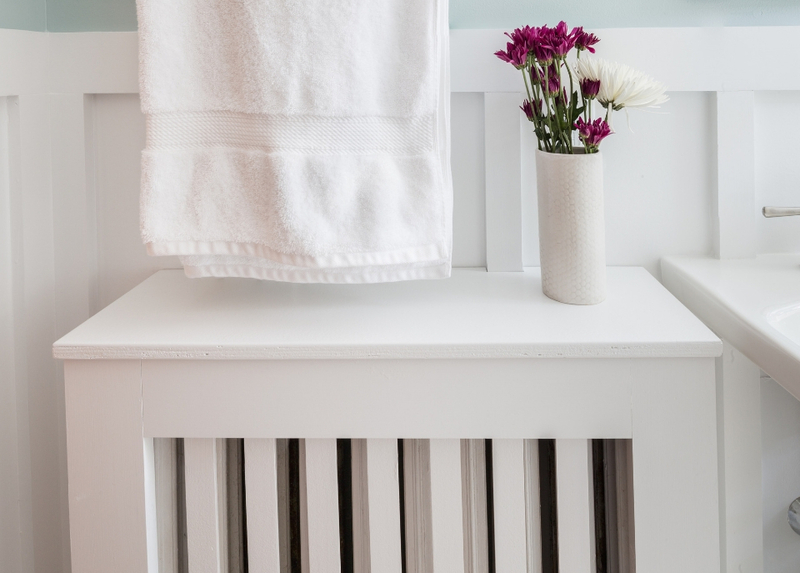 Our interior designer and carpenter foreman designed beautiful radiator covers which were built on-site for all of the bathrooms. Finally, even with all the plumbing complications, electrical issues with moving wires, the budget impacts from the expanded design, and the concerns for cleanliness and staying on schedule, the final result was a trio of bathrooms that beautifully blended design and function. And best of all, the customers were thrilled with the results!